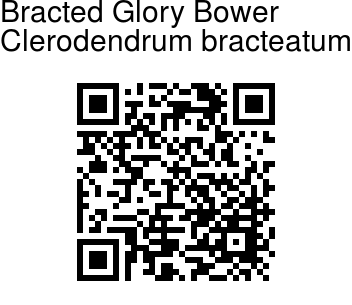 Bracted Glory Bower is a shrub or small tree, 3-4 m tall. Branchlets are 4-angled, densely yellowish brown woolly. Leaf-stalks are 2.5-4.5 cm, densely velvet-hairy; leaf blade ovate to broadly ovate, 11-16 x 6-10 cm, below densely hairy, above bristly-minutely hairy, both surfaces yellow to orange glandular dotted, base broadly wedge-shaped to subflat, margin entire or subentire, tip tapering. Flowers are borne in leaf-axils, in cymelike flower-heads. Flower-cluster-stalks are 3.5-13 cm long, bracts persistent, elliptic to ovate, 1-3 cm, tip tapering to with a tail, velvet-hairy, glandular. Calyx is red, about 1.6 cm, membranous, deeply 5-lobed, outside finely velvet-hairy, with several small and large glands, inside hairless; sepals ovate-lanceshaped, about 1.1 cm, tapering. Flower are white, 1.8-3.5 cm; tube slender, outside finely velvet-hairy and glandular, inside hairless. Petals are oblong, 6-8 mm. Stamens are equal or slightly longer than style. Drupes are enclosed in calyx, green when young, purple-black at maturity, nearly spherical, about 6 mm in diameter. 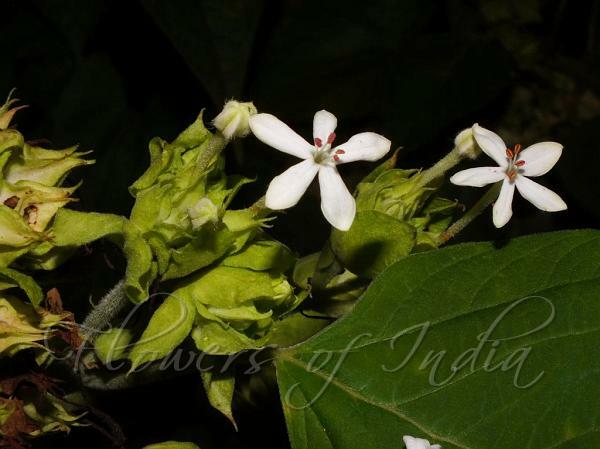 Bracted Glory Bower is found in the Himalayas, from Nepal to Sikkim, Khasi hills, Assam, Burma, at altltudes of 400-1600 m; Flowering: July-November. Identification credit: Santanu Dey, Nidhan Singh Photographed in Assam.